Last week a host of international brass solo artists and more than 250 competitors met on the island of Jeju in South Korea, for a week's music making with the focus very much on competition. There were solo competitions for trumpet, horn, tenor trombone, bass trombone, euphonium, tuba and brass quintet. An extremely a high level of performance was achieved in each competition, culminating in a winner's concert with the Jeju Philharmonic orchestra last Saturday. The prize money was quite staggering with a first prize of 7000 U.S. dollars in each solo competition (2nd prize $5000, 3rd prize $4000), and a first prize of a $12,000 for the brass quintet. Quite understandably such prize money attracted players from all round the world, and in the euphonium class for example there were over 50 competitors, playing in three rounds, the final round being with symphony orchestra accompaniment. The list of adjudicators was similarly quite extraordinary, with 7 judges in each section. Many of the most famous brass players and soloists in the world were on the jury, many of whom also gave solo performances during the week. 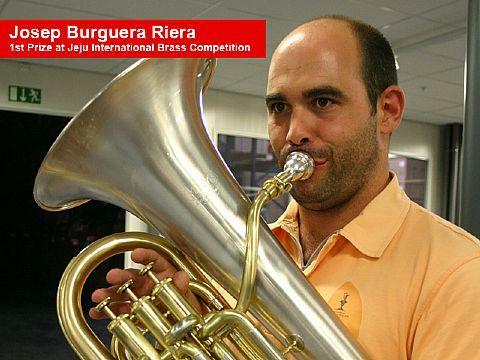 Jury members included tuba stars Oystein Baadsvik, Roger Bobo, Roland Szentpali, euphonium artistes Steven Mead, Toru Miura, Adam Frey and other leading Asian players, trombonists Jacques Mauger, Armin Rosin and Larry Zimmerman, trumpeters Eric Aubier and Max Sommerhalder for example. It was an incredibly well organized competition, a model for other such events. Steven Mead, president of the jury, described the final as demonstrating: "a remarkably high standard of music making, and we had 4 excellent performances of the Euphonium Concerto by Vladimir Cosma. It's been a pleasure to be part of this event and the organisers and all competitors are to be congratulated. The large jury and clear voting system made for a very balanced set of results." The next event of its kind in Jeju will be in August 2012.